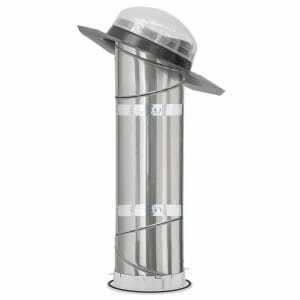 Bring natural and bright daylight to places with no direct outlook by installing the VELUX TGR 010 0000E0 10″ sun tunnel with acrylic dome. This model is intended to bring energy-efficient, natural daylight into dark spaces in the home through a specially designed tunnel which goes from roof to ceiling. The TGR skylight features a rigid tubing that makes it excellent for long tunnel runs. The TGR 010 0000EO is a perfect solution for hallways, bathrooms and other rooms where daylight can only be provided by opening a door. This model in particular is designed for a 14-60 degree roof pitch. The low-profile metal flashing cuts installation time in half and blends perfectly into the roofline. The quad diffuser of this sun tunnel is very energy efficient and meets Energy Star requirements.